The macroscopic quantum spin state of caesium atoms held in a vessel has been teleported to a second vessel 50 cm away – according physicists in Denmark, Spain and the UK, who have performed the feat. 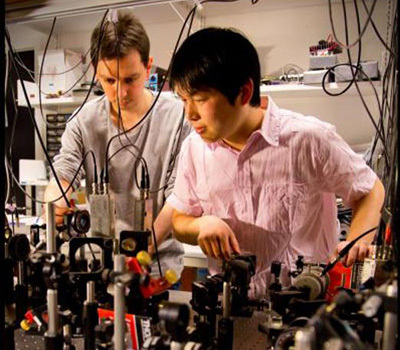 Although this distance is far smaller than the 143 km record for the quantum teleportation of relatively simple states, the experiment achieves a different type of teleportation that had previously been achieved only across microscopic distances. The technique can teleport complex quantum states and could therefore have a range of technological applications – including quantum computing, long-distance quantum communication and remote sensing. Quantum teleportation was first proposed in 1993 by Charles Bennett, of the IBM Thomas J Watson Research Center in New York, and colleagues. It allows one person (Alice) to send information about an unknown quantum state to another person (Bob) by exchanging purely classical information. It utilizes the quantum entanglement between two particles; one with Alice and one with Bob. Alice interacts the unknown quantum state with her half of the entangled state, measures the combined quantum state and sends the result through a classical channel to Bob. The act of measurement alters the state of Bob's half of the entangled pair and this, combined with the result of Alice's measurement, allows Bob to reconstruct the unknown quantum state. This is usually demonstrated with discrete quantum states, such as single atomic spins that can be up, down or a superposition of these two states. In principle, however, it is possible to teleport quantum states that are effectively continuous, such as the collective spin of a large atomic ensemble. Furthermore, doing so would have interesting practical consequences for the development of technologies based on the teleportation process. For Alice and Bob to send information using quantum teleportation, they must first be in possession of entangled particles (usually photons). Swapping entangled photons inevitably results in some being lost and this will have an effect on the reconstruction that Bob can make of Alice's mystery quantum state. If the information being exchanged concerns a discrete state, it will be entangled with a single photon, which will either arrive or not arrive, and Bob will either make a perfect reproduction or no reproduction of the state. This is known as probabilistic quantum teleportation. If the information concerns a continuous state, it will be entangled with a pulse of light containing many photons. Some will arrive and others will not. Bob can always make a reconstruction of Alice's quantum state but if losses are high then it will be less than perfect. This is deterministic quantum teleportation. A key question is whether or not the fidelity with which Bob can reproduce Alice's unknown quantum state exceeds the maximum possible fidelity achievable if Alice simply measured the state and told Bob the result – a limit imposed by the Heisenberg's uncertainty principle. This will depend not just on the proportion of photons lost but also on other experimental parameters, such as the length of time the quantum states can be preserved for interactions between the unknown quantum state and the entangled particles. This deterministic continuous-variable teleportation was proposed and realized in the lab by Eugene Polzik and colleagues at the Niels Bohr Institute in Copenhagen, together with researchers at the Institute of Photonic Sciences (ICFO) in Barcelona and the University of Nottingham. Their experimental set-up involves two room-temperature samples of caesium-133 gas held in glass containers and separated by about 50 cm. The aim of the experiment is to use light to teleport the collective quantum spin state of 1012 atoms from one container to the other. The team extended the life of the state by coating the insides of the containers with a special material that does not absorb angular momentum from the atoms. Precise control over the spin states of the system was done using constant and oscillating magnetic fields. 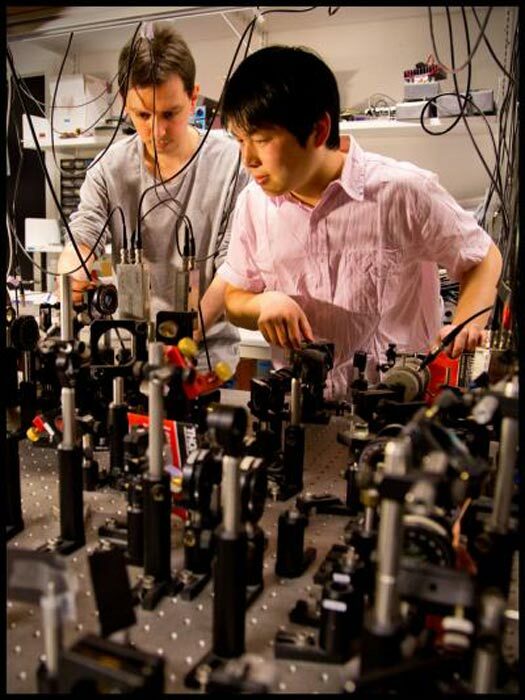 They also collaborated with theorists Christine Muschik at the ICFO and Ignacio Cirac of the Max Planck Institute for Quantum Optics, near Munich, to develop a new model of the interaction between the atoms and the light. Using these advances, they teleported multiple collective spin states between the two canisters and looked at the variance in their measurements. When they compared this with the theoretical minimum variance that could be achieved by sending the spin state information in a purely classical manner, they found that the variance from their process was lower. "We have achieved the first deterministic, atomic-to-atomic teleportation over a macroscopic distance," says Polzik. Hugues de Riedmatten, a quantum-optics expert at the ICFO – who was not involved with the experiment – says that the research is "very significant", describing the results as "convincing". He cautions, however, that it is "a proof of principle", saying "I think it's a first step. If you would like to use it for doing useful things in quantum-information science, for example, you would need to transport much more complicated quantum states. It remains to be seen whether this will be possible or not."